On January 31, 2019, the Fair Housing Justice Center (FHJC) and Enterprise Community Partners, Inc. (Enterprise) released new policy agenda, titled “Closing the Divide: Creating Equitable, Inclusive, and Affordable Communities.” This policy agenda is the result of a year-long collaboration between more than 30 affordable housing, community development, fair housing, and other nonprofit organizations who participated in a Regional Affordable and Fair Housing Roundtable. Co-convened by the FHJC and Enterprise, the Regional Affordable and Fair Housing Roundtable sought to educate affordable and fair housing organizations on key areas of concern to both sectors, identify shared priorities that both affordable housing and fair housing advocates could collectively work to advance or support in various ways, and create a dynamic and diverse working group. Through monthly meetings, facilitated by Bennett Brook of the Consensus Building Institute (CBI), representatives of these organizations were able to build trust and engage in candid conversations in order to fashion a shared policy platform. Driving the community/residency preferences conversation to a productive end. 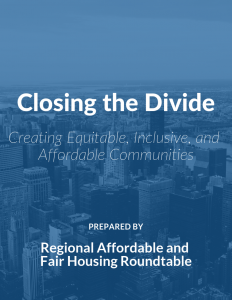 The Roundtable believes that these policy priorities are key to adequately addressing the housing affordability crisis and the discriminatory barriers that continue to inhibit housing choice within the region. Although there has been progress among Roundtable participants to identify shared areas of agreement, some policy issues are still under discussion. It is hoped that this policy agenda will form the basis for continued conversations on issues of mutual concern and spur the creation of effective coalitions and partnerships that can advance these and other policy priorities. Closing the Divide is available for download here. If you are interested in being involved in this work, please contact either the Fair Housing Justice Center or Enterprise Community partners to learn more. The mission of the FHJC, a nonprofit, civil rights organization, is to eliminate housing discrimination; promote policies and programs that foster more open, accessible, and inclusive communities; and strengthen enforcement of fair housing laws in the New York City region.